Work on one of Auckland’s major arterial routes will begin in September following the approval of $66.3 million in funding. 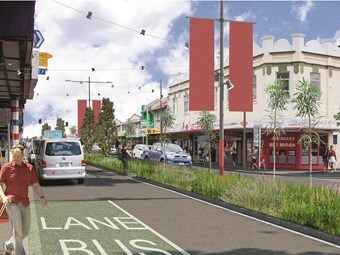 Dominion Road is one of Auckland’s busiest roads and its second busiest bus route. Auckland Transport and New Zealand Transport Agency have recently agreed to fund the $66.3 million project. The project which will transform Dominion Road and the key villages that it serves, will be carried out in stages and is expected to be completed in about mid-2016. Work on the associated cycle routes on streets paralleling Dominion Road, will start in May and be completed by about October. Auckland Transport Chairman Lester Levy says that the improvements to the road will give it the capacity to deliver up to 3 million bus passengers a year to their destinations, quickly and efficiently. A principle outcome of the improvements will be the promotion of bus travel to achieve a projected 67 per cent increase in patronage by 2021. Bus-lanes will be connected from State Highway 20 to View Road and there will be no-parking in them during peak hours. "With population increasing all the time, it is vital to undertake this massive project as quickly as possible," Dr Levy says. "Dominion Road is a key artery and a vital component in improving passenger travel – and safety - for many thousands of people. "It will have an equally important part to play in the strategy for reducing congestion."